I recall the last time Brazil's credit rating was increased, in 2008, as a bevy of Brazilian stocks shot through the roof in afternoon trading that day. 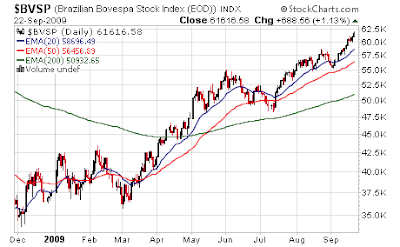 The reaction to yet another increase, this time to investment grade, was not so spectacular - but the Bovespa has been on fire (>60% for the year), and we're sitting on a 7 month rally so it's hard for new news to really move the needle. Brazil’s credit rating was raised to investment grade by Moody’s Investors Service after Latin America’s largest economy built record foreign reserves and averted a prolonged recession amid the global financial crisis. Moody’s cited Brazil’s “strong economic and financial resilience” during the worldwide slowdown as it raised the rating one level to Baa3, the lowest investment grade. The upgrade came a year after Standard & Poor’s and Fitch Ratings increased their ratings for Brazil above junk. Moody’s assigned a positive outlook, signaling it may lift the rating again. The country’s foreign reserves climbed to $223 billion .... reserves were $74 billion three years ago. Brazil’s currency is up 29 percent against the dollar this year, the second-best performance among the 16 major currencies after the South African rand. So the socialists to the south continue to build up foreign reserves and expand their middle class. The communists to the east continue to build up foreign reserves and expand their middle class. The "capitalists" around your local corner? Not so much. I got nothing more for you - all I can do is sigh deeply, smirk at the US dollar, and continue staring at the wall as I clap like a seal at the mechanical moving up of the stock market, which signals American prosperity. Yep.